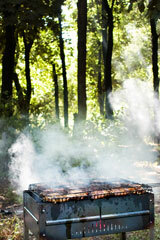 A smoky barbecue grill, laden with delicious meat, is set against a blurred forest scene. Outdoor grills go hand-in-hand with warm-weather cooking, and are a terrific way to add taste and flavor to meat, fish, poultry, and vegetables. Barbecue grills are handy when used to cook for large, festive groups of people, but are also a convenient way to cook for the family. Hear the strike of the match, smell the sizzling food, and take part in the laughter and camaraderie that occurs when the barbecue grill is used. Charcoal fired barbecue grills are popular at picnics, family gatherings, office parties, and any other place where outdoor cooking is desired. 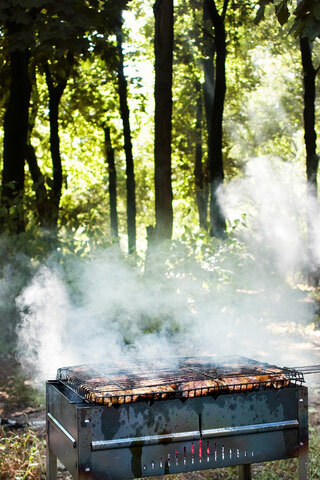 Use the search box on this page to find information about barbecues, grilling, and related topics.